If you get the thing cold first, the metal will expand faster than the wood once you hit it with heat. Last edited by RandyO; 03-22-19 at 12:32 PM. 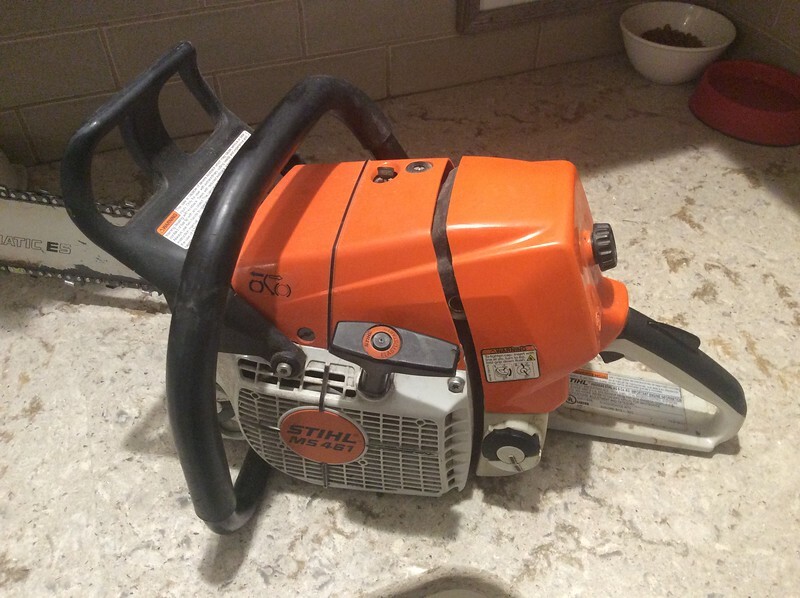 Anyone have a Stihl MS461? 76cc. Thinking about one with 25” bar and ripping chain for the Alaska mill. Only one for sale locally guy is asking $900. New price with full wrap handle is about $1,150. Seems like they sell for $700-750 on ePay. Worth it? I bought this MA310 in the spring of 2007, and average 5-6 cord of wood per year and this thing still runs like new. I dropped this large white oak a couple months ago, the base was just shy of 3’. I also bought the Stihl all in one sharpener, has the file for the tooth, and flat file for the rakes... takes about 5 minutes to sharpen a chain with the 20” bar. I was surprised to find the chain cuts as good as having a new chain. I’ve been taking better advantage of the tools available as well and using the JD 510 to pick up the oak logs with the backhoe and hold them about 2 1/2’ off the ground to cut up... back saver for sure. Wish we had more Oak to burn, it's only about 10-20% of our supply. We mostly harvest leaners and that's a lot of Birch, lately. Did a test run with the Alaska Mill today. 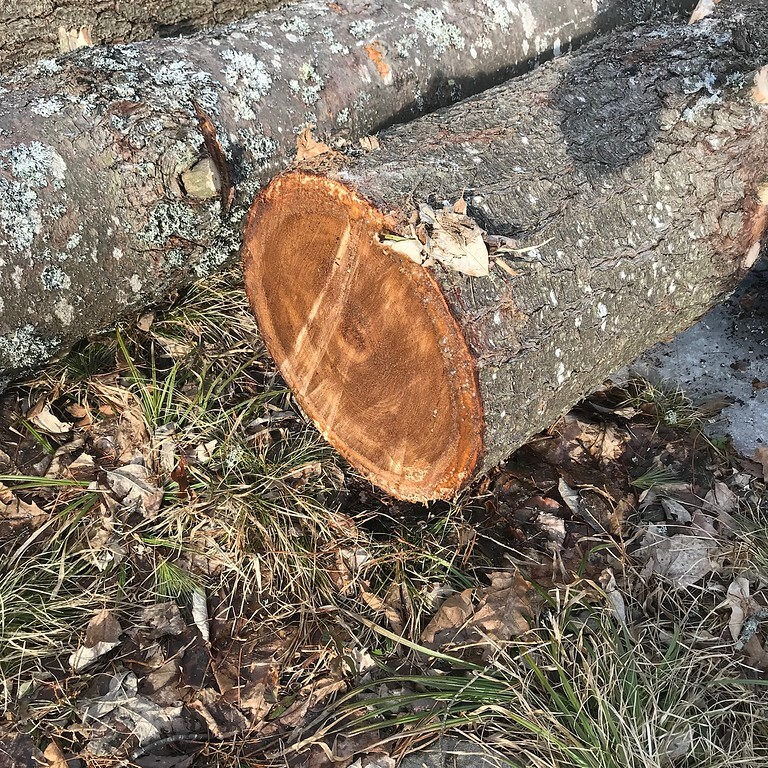 Cut down a 16” dia tree and cut three 10’6” logs. Then used this 12” for a test, as that’s about the size of the bridge supports we will use, and I’ll need to flatten the tops for nailing. Didn’t buy any special frame or use an aluminum ladder. Just screwed a plank to the top to use as a guide. The Alaska mill works well. I’ll definately raise the work when doing it for real. I just used one wedge in the end, going to need a couple more. I was using a Stihl MS271 (50cc) with an Oregon ripping chain. For any log much bigger than this, you’d definitely want more power, but if you take your time and let the saw do the work it’s sll good. Last edited by Garandman; 03-27-19 at 07:49 PM. Good on you for giving it a try. I've got a 5' maple log I want to slab. Thinking SV650 powerhead. I have a gazillion ft of pine. Kind of sort of would like to use something like that to rip 4x4 posts to build a tree-house or something. 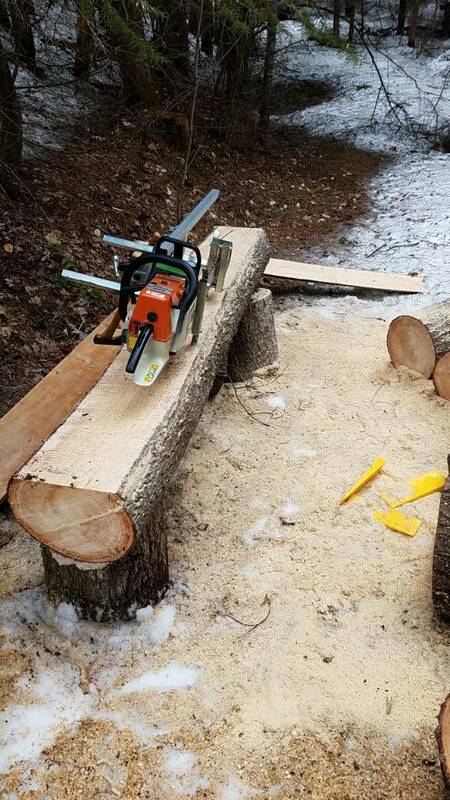 no need of a tool for the 2nd square cut..
turn the log 90 degrees. use ASM for the square cut. Already have the tool. 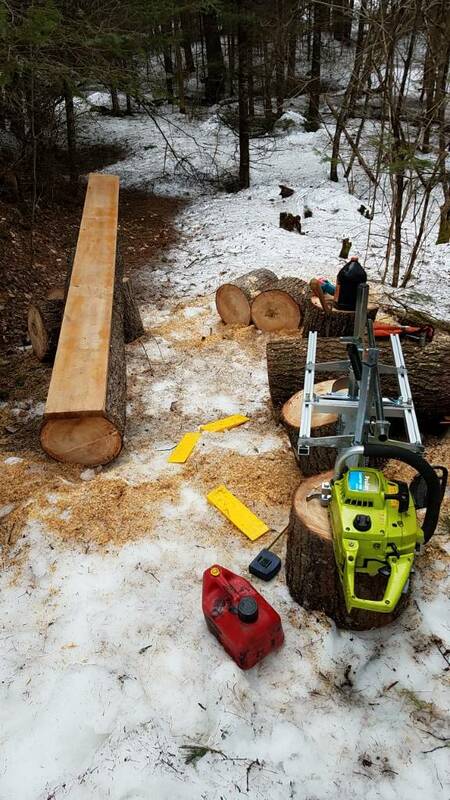 It minimizes handling, as you mill one side, then the other without moving the log, then you can start planking. FYI I think the “Beam Machine” is simpler and probably better. I’m looking at used MS441’s and MS461’s, with 25” bar. You lose a couple inches with the Alaska mill setup and the trees I’m planning to harvest are 20” or more. The MS271 isn’t too heavy and is great for bucking with an 18” bar, but you are in the tree for a longish time felling. Even though I’m only cutting Hemlock or Pine. Last edited by Garandman; 03-28-19 at 08:21 AM. Felling/Milling power problem solved. 77cc, 6bhp, 25” bar. Was advised to paint the ends of logs before milling to prevent checking. 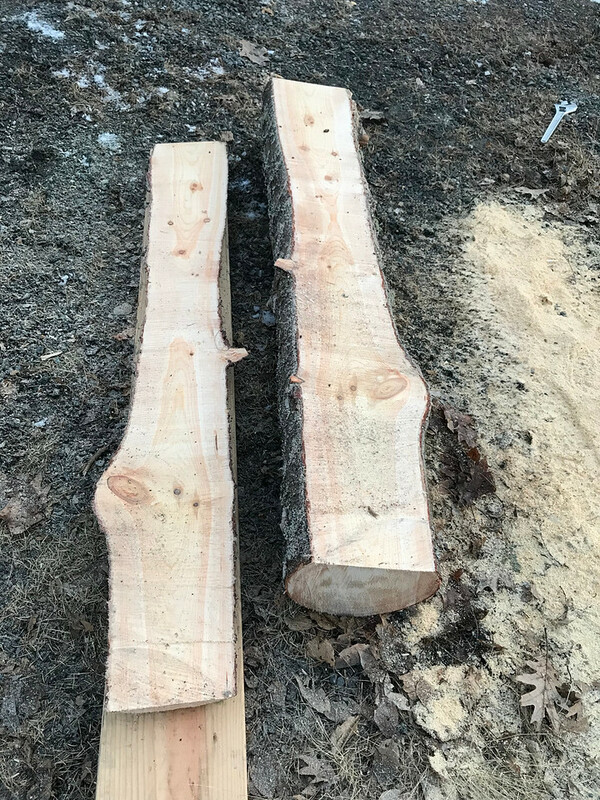 I cut them 6-8” long just in case. Last edited by Garandman; 03-28-19 at 09:23 PM. You'll like the 461. It has a lot of power for its size. 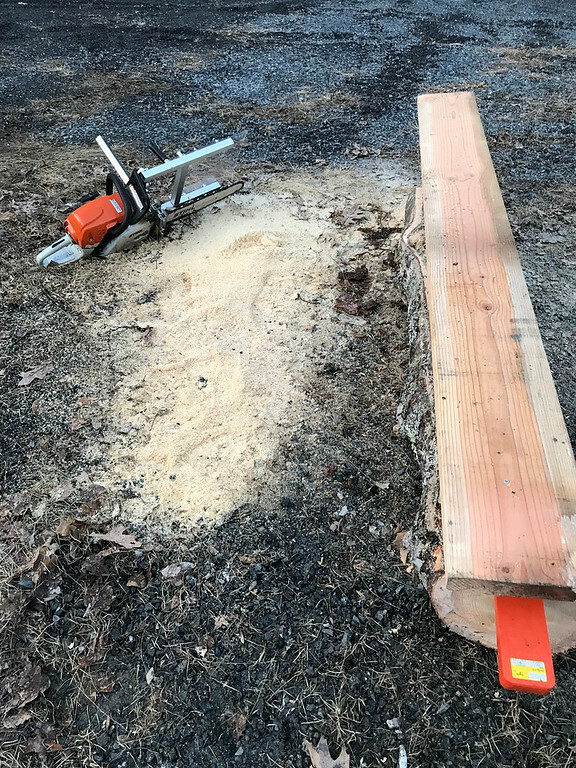 If you want a silly fast firewood saw, throw a 20" bar on it, go up a tooth or two on the drive sprocket, and file the rakers down on a fresh chain. It will fly through anything you cut down in this area of the country. A new MS461 (77cc Pro grade) is $1,040 new and nice used ones sell for $800+ regularly. 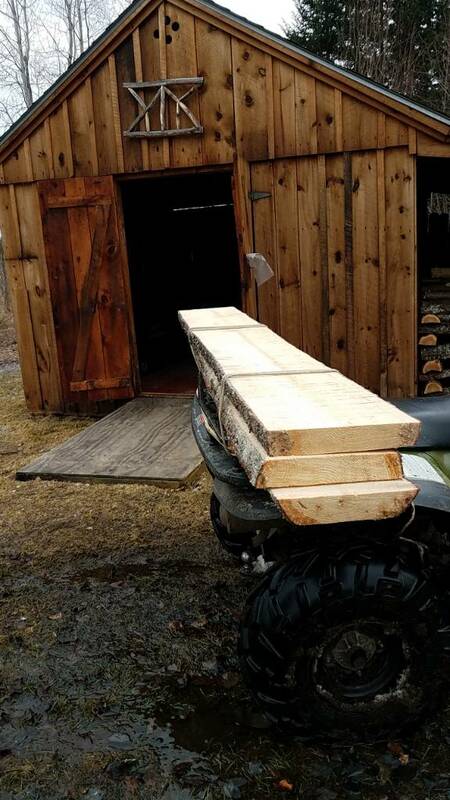 Guy just listed one in Gilmanton NH for $600. I have a home use echo 18” which runs just fine. However, the chains seem to go dull very quickly. I am not interested in sharpening the teeth. Are there better made chains that will stay sharper longer? In my limited experience, Stihl chains last longer, but are harder to sharpen: I suspect there’s more chrome in the steel. We use thrm but have the shop sharpen them. Oregon chains are standard on Husqvarna, and the dealer recommended them if you are sharpening yourself. According to GIS, they also make Echo chains. If you bring the chain or saw to a Stihl dealer they should be able to fit one. Stihl chains are marked green if they are low kickback. They also have yellow-marked chains that cut better, with higher kickback risk. Just switched myself. If you go to echo-USA you can look up the operator manual, which will give you chain pitch and number of links. Last edited by Garandman; 04-13-19 at 10:00 AM. pretty well with the cheap -o-hand-file. Was thinking of getting them all evened up. pick up a 120v grinder as i am finding myself cutting around the house and cabin more often. Recommendations on what i should be looking for? If you are buying your own sharpener, plan on a couple hundred for something decent, IMO. Many of the cheaper sharpeners I've seen have a design flaw in the pivot point and eventually the grinding head starts walking all around after several uses...same with the chain clamps. I had my eye on the Oregon sharpener. On the pro-sharpening, I've paid anywhere from $5 to $14 per chain. Eddie’s in Derry, $5. PowerBarn in Bradford NH used to be $7, then $8, and recently $10. Huskie dealer in Peabody charges $8. Think this will be an almost exclusively full time cutter saw, but an interesting technical achievement. The smallest fuel injected motor we have is a Yamaha 250: this Saw is 79cc! MSRP is around $1,750.